This Slow Cooker Filipino Chicken Adobo is a simple and humble dish, modernized a bit by the use of Yondu Sauce. 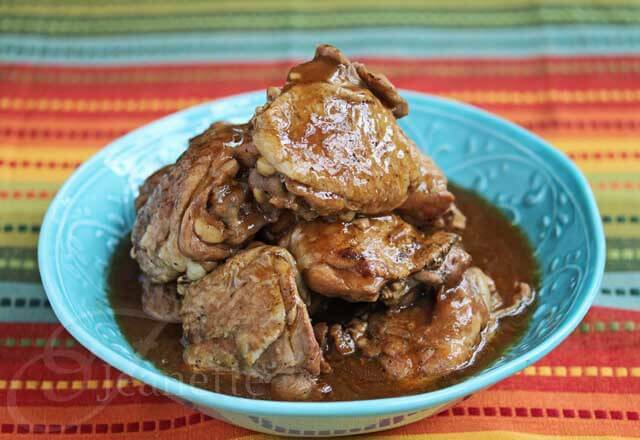 Filipino Chicken Adobo is one of the dishes I remember my mom making. It has a tangy vinegary sauce, kind of like salt and vinegar potato chips. I’ve made it for my kids over the years, and they love it which I was surprised by, given the strong vinegary sauce that this chicken is braised in. They love mopping up the sauce with rice. This past week, I decided to try making Chicken Adobo in my crockpot. One of the tricks that I’ve found works nicely when making chicken in the slow cooker is to saute the aromatics (onion, garlic and ginger in this case) and brown the chicken first. This helps develop deeper flavors in the finished dish and is well worth the extra effort. 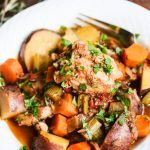 With after school activities in full swing, I know I’ll be depending on my slow cooker for no-fuss dinners at least a few nights during the week. 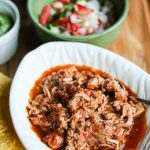 I’ll be pulling out my Crockpot Jamaican Spiced Chicken Stew recipe, Crockpot Turkey Bolognese Pasta Sauce , Crockpot Cincinatti Chili, Barbeque Pulled Chicken, and Asian Chicken Stew recipes. 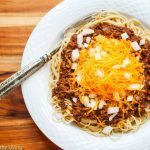 In any of these slow cooker recipes, whether you’re making chili or bolognese sauce, you’ll get much more flavorful results if you take the extra time to saute the vegetables and brown the meat before cooking it in the slow cooker. 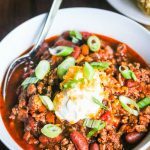 For this recipe, I used a new product called Yondu, which is a Korean sauce similar to soy sauce, but with a more complex flavor and less sodium. I’ve been trying it in stir-fries and loving it. So far, I’ve only seen it available online for purchase, but it’s worth trying if you’re looking for a lower sodium alternative to regular soy sauce. The perfect accompaniment to this Slow Cooker Filipino Chicken Adobo would be steamed rice and stir-fry bok choy. You can start the rice in your rice cooker and keep it on warm. When it’s time to eat, just stir-fry the bok choy and dinner will be ready. Browning the chicken first with onion, as well as the garlic and ginger, adds extra flavor to this slow cooked dish. You don't have to thicken the sauce if you don't want. Heat 1 tablespoon oil in a large skillet and add onion, garlic and ginger; cook for a few minutes until fragrant; remove to slow cooker using a slotted spoon. Add another tablespoon of oil to pan. Add chicken pieces and brown on both sides. This may take a few batches depending on the size of your skillet. Remove chicken to slow cooker. Mix together Youndoo sauce, soy sauce, vinegar and water. Pour on top of chicken. Place bay leaf inside slow cooker. Cook on high for 4 hours. Remove chicken and place on serving plate. 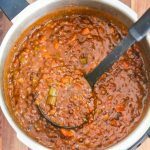 Strain gravy into a saucepan. Mix together cornstarch and water. Whisk into gravy and cook on medium until gravy thickens. Substitute 2 pounds skinless, boneless chicken breast for lower calorie version (181 calories/1 Freestyle point per serving) - cook on high for 3 hours. I adore Chicken Adobo. A slow cooker version is perfect for fall. 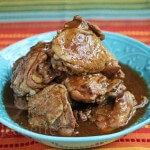 Carolyn – so glad you like Chicken Adobo. My mom used to make it when I was growing up and it’s just pure comfort food. Coming back from a long trip adobo was the first thing I cooked to make me really feel like I was home. I’m with your sons, I love to mop up all that sauce with rice, too. Your pictures are mouthwatering!! Jean – whenever we travel, we’re the same way – everyone wants some home cooked comfort food. The sauce in this dish is the best with steamed rice! Kind of like salt and vinegar chips? Uh, yeah, I’m sold. This looks fantastic, Jeanette! 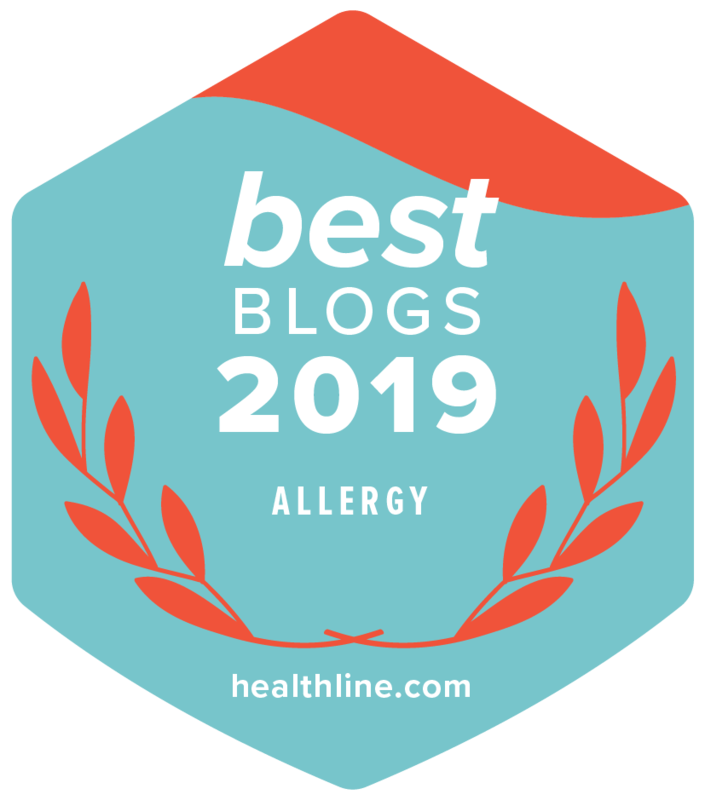 Thanks Dara – I was surprised my boys liked this dish, but they really do love it with the tangy salty flavors. Thanks Billie – I hope you enjoy this! Chicken Adobo is soooo tasty! Thanks for sharing your slow cooker recipe for it, Jeanette! 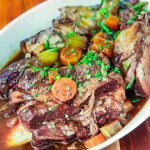 The slow cooker definitely conveys comfort food – we all need that once in a while. A great comfort food. Thanks for the inspiration. Thanks Lail – I am inspired by food that I grew up on and learn about now as an adult. Chicken Adobo is such a cozy, comforting meal! Great recipe, Jeanette! Sommer – I couldn’t agree more. My boys love this dish! Thanks Kelly! I’ll be making this again this week. My kids keep asking for it. I still remember my first chicken adobo I made – the recipe was from Carolyn’s (above) blog and I still make it (such an easy recipe!). 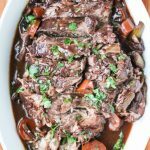 Now that I saw the slow cooker version, I have to check this out!!! Looks amazing, you capture deliciousness of this adobo so well and I’m very tempted after seeing the photos! Thanks Nami – I love the simplicity of this comfort dish – so many times, the simplest dishes are the most memorable. I was unable to find Yandoo sauce. Would replacing it with soy be okay? What would you suggest? Hi Kristin, yes you can substitute low sodium soy sauce for Yondu. Yondu is lower in sodium than regular soy sauce. 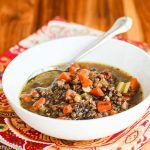 Loving the apple cider in this recipe! I need a slow cooker, ASAP! Thanks Kiran – my slow cooker is over 20 years ago and still going. EA – this is the national dish in the Philippines so very popular among Filipinos. My mom lived in the Philippines for many years so she made this for our family growing up. Thank you so much for posting this recipe. My ex-boyfriend that I was with for 10 years was Filipino and we used to eat adobo once a week. I have a family and I want to make this for them but can never remember the ratio of soy sauce, vinegar and water. 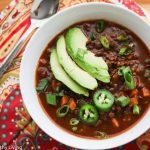 The crockpot idea is even better! Thank you!!! 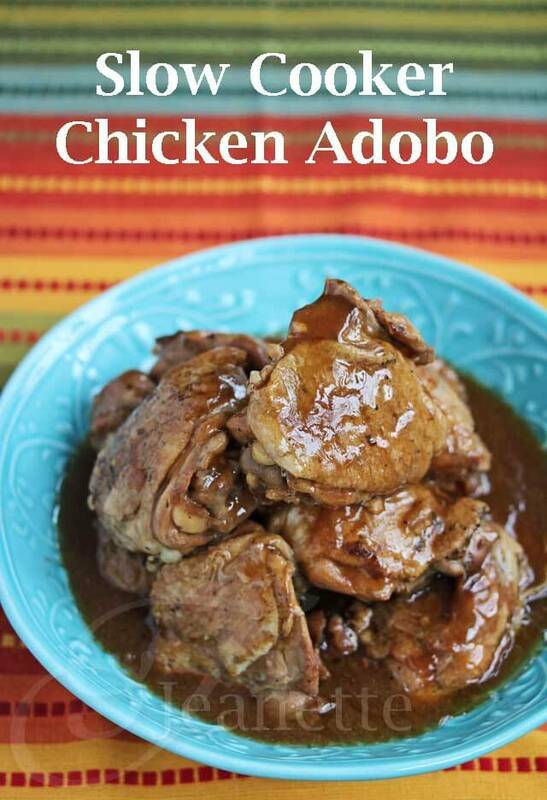 Hi Christina – so glad you like Chicken Adobo – my kids love it! G’day Jeanette! LOVE Chicken Adobo, true! When I saw your photo and that it was your mum’s recipe, I knew this was on my list to do too! Thank you! I use this recipe every month. I’m a Maritimer, but my husband is Filipino. 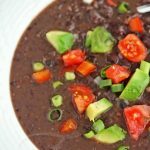 Him and the kidlet absolutely LOVE this recipe! I always make extra sabaw though, we too love to soak up our rice in it! My husband loves to rave to his mom and the aunts how good my adobo tastes. lol Thank you for making me look good! So glad you and your husband have been enjoying this recipe. My mom made adobo chicken a lot when I was growing up and my kids now enjoy it too. I like to use sugar in mine, what is your opinion on that? Haley – I’ve never added sugar to mine as the way I grew up eating this was a savory dish with vinegary sauce. Chicken Adobo was one of the few dishes I truly loved during my year in the Philippines. I’ve never been able to truly duplicate it at home. Thank you for this recipe, Jeanette. I think you are onto something when it comes to the aromatics and slow cooking. Can’t wait to try! Julia – hope you enjoy this. My mom used to make it when I was growing up and it’s always been a comforting dish. Finally made this tonight–I’ve been holding off until I could get get some Yondu sauce, which didn’t happen. I used coconut aminos which tastes just like soy sauce but has less sodium. Anyway, came out great. I shredded the chicken off the bone and it soaked up all the sauce so next time I will double the amount of sauce.